One of the things I like to cover in my blog are topics that are only rarely covered elsewhere (perhaps for good reason LOL). 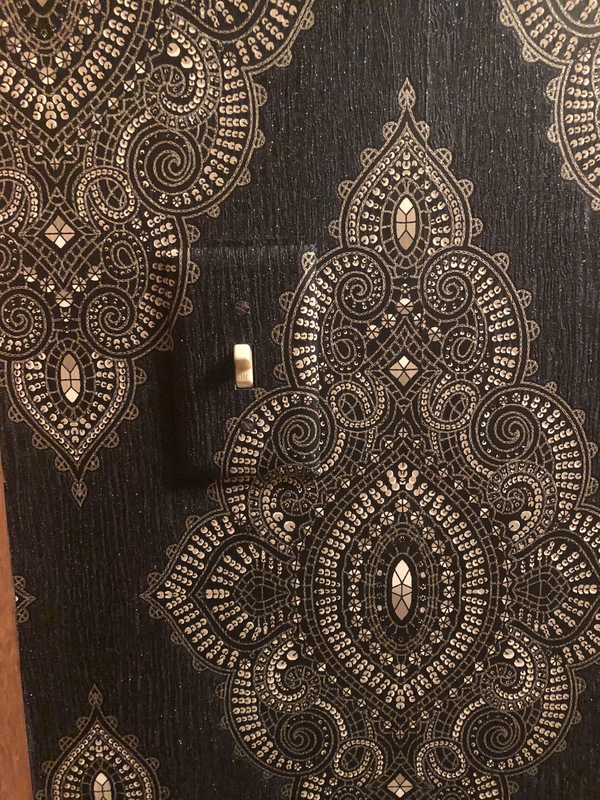 In my recent book downloading efforts, I found one with a chapter on portiéres (room door curtains), so I thought I would do a blog post to convey the information they provided. This is a word-for-word transcription of the chapter. The book is called Art and Economy in Home Decoration and was written by Mabel Tuke Priestman and published in 1908. If you'd like to see the original text, you can download it here at Internet Archive. IN many country homes curtains that suggest the modern trend of thought would be out of harmony with their surroundings. If a parlor is furnished in Empire style, what could be more incongruous than hangings of coarse canvas, ornamented with art-nouveau designs? The curtains must be in harmony in tone and design with the Empire period, and would need to be made of rich-looking materials, overtopped with the fitted valance ornamented with Empire designs. Georgian and French styles must be treated with the same restraint, if the rooms are to be faithfully carried out in any one period, and the curtains must conform to the general style of the room. 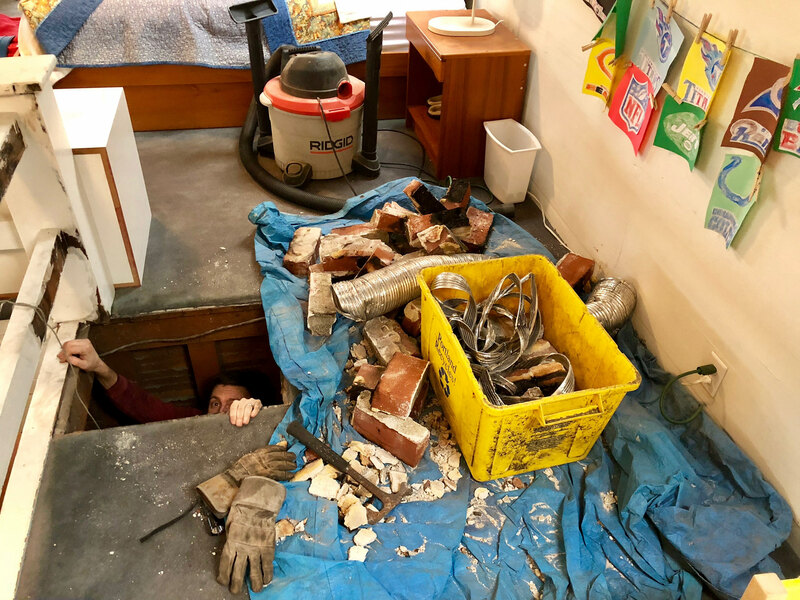 In going into houses of well-to-do people, it is surprising to find that draperies that have been made by reliable firms have lost their shape and sag. This should not happen, and would not if sufficient care had been taken when the curtains were made. When they are laid out on the cutting table the interlining must be sewed or basted to the material, so that when in place the curtains keep their shape. Sometimes the bastings are caught only here and there, and after a while they give way: the result is a sagging, lumpy-looking curtain. If the curtains had been made properly in the beginning this trouble would have been avoided. The draperies of a room should always harmonize with the walls, but should be stronger and richer in tone. Hanging in soft, straight folds, they soften the hard lines and add much to the beauty and dignity of a well-planned room. In providing portières for a double door, the portière can be made by lining or sewing two separate materials so as to form one curtain. The curtain itself will look well, but either one side or the other of the opening will show a blank space of woodwork; also when the sliding doors are closed, one room will be without its portières. The most usual way is to make the portières to suit each room, the lining of one matching the front of the opposite portière. It is best to use sateen as a lining, as this is made in a wide range of colors. Wherever possible, the lining should match the curtain, but if the heavy curtains at a window are hung wide enough to come in front of the cream or white curtain, and will be seen through the sheer curtains from the outside, then they must be lined with cream. To my mind curtains lined with the same shade are much more attractive than those lined with white or cream, but they should not be more than twenty-four inches wide when pleated up, and not be brought forward to go in front of the window. An abomination constantly seen is a pair of heavy curtains meeting in the middle of a window and then held tightly back by a cord or band. They give a feeling of uneasiness to those who appreciate the fitness of things, and are in themselves a contradiction. Why hang them forward if you want them back? The same fault may often be seen in sash curtains. They are hung on a rod at the top and bottom of a window, and then a foolish white band or cord holds them back in the middle. In selecting materials for curtains suitable for rooms furnished in period styles, there are many beautiful patterns to choose from, and at prices to suit nearly every one linen, velours, upholsterers' velvets, Liberty velvets, silk-crinkled tapestries, brocades, corded silks, goat's hair, Armures, and figured tapestries, all of which make suitable hangings for various rooms. From time to time attractive materials, representing weaving or cross stitch, are brought out and charm the eye with their color and texture. A material with a design of trees and birds looking as if they had come out of the ark comes in useful for a piano-back or book-case curtain. It comes with a tan ground, and the design is in one color. It is charming in the blue green on a tan ground, and also in copper, while the red and tan seem equally suitable for some quaint hanging. Successful experiments have recently been made in evolving new and interesting ideas for hangings for doors and windows. We are all familiar with the lined and interlined velours and tapestry draperies that are always to the fore in most handsomely furnished houses. They have their place in classical work, and for the purpose of excluding draughts, but they are not the kind that appeal to craftsmen of today. It is remarkable how little is known of what is being done all around us in the development of original and artistic curtains, not only by artistic individuals, but by communities of craftworkers throughout the country. The results are obtained, not by buying costly silk and satin draperies, but often by the use of the simplest textures, in which color or applied design play the important part. Arras cloth, or craftsman's canvas, has been a joy to the privileged few who happened to know where and how it could be obtained. Happily it can now be bought at one or more shops in every city. It is very like every-day burlap in weave, and is made of a mixture of linen and cotton. It possesses a slight variation in texture that is very desirable in draperies. It is made in Scotland in a wide range of colors which fade so little with years of wear that the effect is only a softening of tone. It is now obtainable in linen color as well as the art shades. People who have always appreciated linens enjoy those with a coarse mesh called "bloom linens." They are an inspiration for making applique upon Arras cloth or other shades of linen. Coarse Russian linen sold for kitchen towels is another material constantly overlooked. Its decorative possibilities are endless; the gray in which it is made is a suitable color for using in bedrooms when a quiet groundwork is needed for applique or stencil treatment, or darning. This material is only fifteen inches wide, but the joining of the widths lends itself to decorative needlework, and a hinged effect in stitching gives it much individuality. that is remarkable for the way it holds its color is Tudor silk, which is fifty inches wide. Liberty or Corean silk, thirty-six inches wide, can be substituted when the Tudor is not available. For an unlined curtain requiring little weight, the Helena tapestries from Scotland, designed by Voisey, are some of the most beautiful fabrics imaginable. They are made of mercerized cotton. 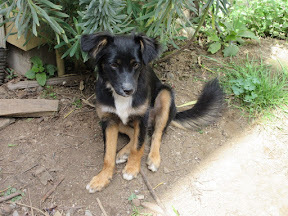 The weft and woof are never the same color, so that the effect is iridescent. The designs are excellent. They are also made up in the seventy-inch Madras. The latter are found at most of the best stores, but the Helena tapestry has to be looked for, as so choice a material is often confined to one or two stores in each city. Some folks have never even seen this material, but those who are familiar with it never waver in their appreciation of it. In a room with self-toned walls and window curtains, Helena-tapestry portières with a voyant design of a flower motif make beautiful hangings and an unusual note of decoration. Arts and crafts societies have for sale many kinds of woven fabrics; the Acadian weaving industries, having been revived and fostered of Jate years, are now making the old Evan￼geline portières; while from the mountain regions of the South the old blue and white coverlets, so dear to our grandmothers, are made into portières and curtains which are more suitable for blue and white colonial rooms than almost anything else. For light hangings, what beautiful prints can be found among the East-Indian cottons, not only in pale yellows and greens, but in deep warm shades! Javanese draperies with their stencilled Batik work, done by hand by the women and children of Java, can be used in nearly any room. Craftworkers are beginning to do a modern form of Batik, which consists in dyeing a piece of cloth which has had the parts where the design appears protected by a process, so that the groundwork takes the dye but not the pattern. This industry is only in its infancy in America, but it is an interesting field open for immense developments. A description of a few portières and curtains that have lately been made will not be out of place. A portière of Arras cloth with an applied design in linens made an effective drapery in a living-room; the groundwork was wood-brown, a pine-cone motif was carried out in rich dark greens and tans, the cones being in green with dark outlines, while the needles and deep border band were in tan. Another portière, made of deep olive green Arras cloth, had an effective design of conventionalized nasturtiums. The leaves and flowers were in old gold linen with a band of soft tan. Another band of green forming a base for the slender stem lines was held in place by stitchery in heavy green floss. Yellow floss was used for the flower centres and stems. This portière with olive green walls and light brown mission furniture, with tan leather seats, gave just the decorative note needed in a craftsman's library. Appliqué can be very decorative when done by artistic people; but such dreadful draperies have been sold that it is necessary to be very cautious in buying, carefully considering the individual merit of each piece. A curtain of russet tones was ornamented with an apple and disk frieze treatment in reds and tans, and was extremely decorative and unusual. It was made of changeable linens, the design being outlined with embroidery silk in art stitch. A great deal of hand work was put on these curtains, but much the same effect could be attained by couching the outline in heavy flax. The same design was used for linen sash curtains in a summer cottage, and the general effect was excellent. The work was taken up at odd moments, and was a pleasant recreation. If preferred, the same design could be stencilled instead of applied, and then outlined with coarse stitching. Ina summer house this is often advisable, when the time cannot be spared for much needlework. A design in pomegranates was made up in three shades of gobelin blue linens on Arras cloth and was outlined with flax worked in art stitch. These hangings were very effective in a living-room of blue and mahogany. Another successful portière consisted of a large tree motif, made up in blue and green linen on a tan linen ground. It was outlined in coarse embroidery stitch. Such a design, however, would look well only if suited to its surroundings in a room furnished in art nouveau. Many specimens of modern weaving have been exhibited in New York from time to time. Besides the ordinary woven curtains, with which we are all familiar, there were some gobelin draperies, woven by Norwegians in beautiful colorings. One of swans on a geometrical background was an exquisite piece of work in soft grays and yellows. Another design in a flower motif was transparent, and was one of the most beautiful pieces of weaving possible to be imagined. When such products of the hand-loom can be made for our use, it seems strange that in the homes of millionaires they are rarely found; but costly, common-place hangings are often seen, which should not be tolerated. Expensive lace curtains in large designs always seem to be out of harmony in a small country house. Slight gauzy effects at the windows to soften the light, and yet which are sufficiently transparent not to exclude the view,seem more appropriate. They can be bought with simple Renaissance edging or an insertion of torchon lace, in soft creamy tones, and seem suitable for all occasions. For libraries and halls, the Arabian color is often preferred. Bobinet also makes a pleasing curtain. The large open mesh does not keep out the light. For a colonial green and white house, where only white can be successfully used, Swiss in plain or striped effects are always in good taste if well made. The curtains should have ruffles, and, with care, they will last for years. 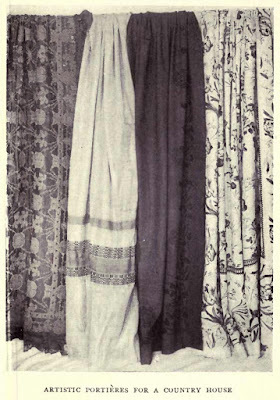 Flowered Madras curtains are found in all shades and are most useful, especially as inner hangings. They are made in such beautiful colors, and are so serviceable, that we should do badly without them. They fall in such soft folds when used as an inside drapery, while the effect of one entirely covering a large hall window is translucent and suggestive of soft-toned stained-glass windows. 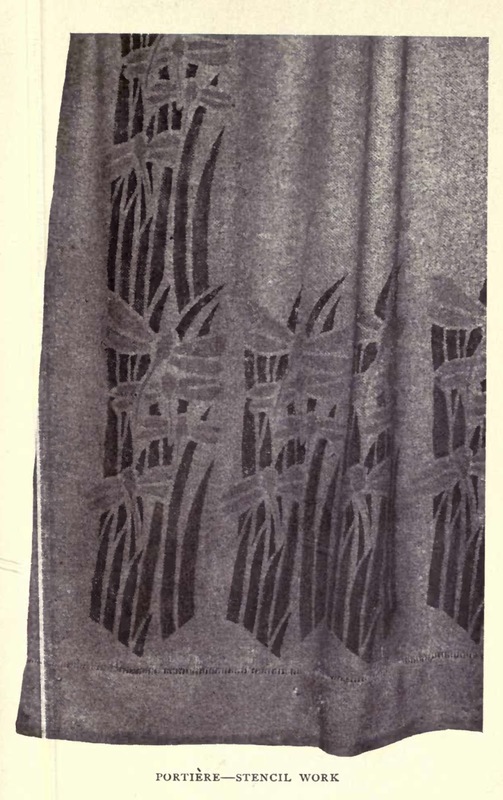 Stencil curtains for any room or scheme have any possibilities for the artist. A good dye is the best pigment, and when the color has been set, will stand frequent washings and sunlight. It should be the aim of every one who has an appreciation of the beautiful to endeavor to get away from the commonplace. It is not practical or possible for many to make their own furniture or weave their rugs, but it is possible for every home to express the individuality of the owner in the choice of beautiful and original hangings.